A military parade may soon look less like a VE-Day parade down Times Square and more like a Mardi Gras parade in New Orleans, unless liberals in leadership stop using the U.S. military as a social engineering experiment. Let us not forget the same president who confused "corps" with "corpses" and exchanged a traitor for terrorists, also promised to fundamentally transform America. What we didn't know is that transformation would begin with the U.S. military, the protector of our nation and our values. The wussification of our military is in full swing, thanks to all the empty suit "yes-men" clad with stars and medals prancing about the Pentagon promoting political correctness [PC]. 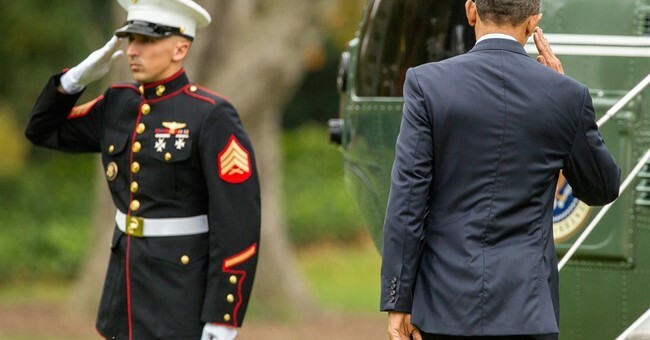 Obama has done a remarkable job hiring, inspiring and attracting military leaders who check their backbones along with their cell phones at the Pentagon's front door. Valiant leaders like Gen. Stanley McChrystal had to exit before the spine removal surgery could begin. You may recall the Washington Times piece awhile back reporting that Arizona State University Army ROTC cadets were allegedly pressured by leadership to walk around in high heels to "raise awareness of sexual violence against women." Raise awareness? I reviewed the pictures and fail to grasp how male soldiers sporting heels, many in uniform, did anything but serve to demoralize those who voluntarily serve. Meanwhile, the Commander-in-Chief wearing mom jeans sits in the Oval Office with his pen and phone diligently working to leave his legacy of a softer, gentler, more touchy-feely military. Mr. Obama recently added verbiage to the Army's section of the 2017 DOD budget, ensuring the Army "will provide every Soldier and civilian equal opportunities to rise to the level of their merit regardless of their gender, their race, or their self-identity," reports the Washington Times. While unbiased opportunity is terrific, what place does "self-identity" have in an organization steeped in conformity and tradition, not individualism? In this brave, new age of "Call Me Caitlyn" and Rachel Dolezal, the corrosive effects of political correctness in our public restrooms will do the same to the military. As it stands, the next president will inherit a squishy U.S. military, so slimmed down and overrun by political correctness it is virtually unprepared to address the rising threats of a dangerous world and defend the United States as the Constitution so charges. A Heritage Foundation's 2016 index of U.S. military strength report scored our military in aggregate, "only marginally able" and trending toward "weak" to defend the United States. The analysis also found that while the current military force is "capable of meeting the demands of a single major regional conflict," it would be "very hard-pressed" to do more -- and is most likely ill-equipped "to handle two nearly simultaneous major regional contingencies." This extremely poor score couldn't come at a more dangerous time, considering the same analysis also reports a rise in threats to U.S. vital interests. No wonder Russian SU-24s recently felt so emboldened, they repeatedly harassed a U.S. Navy destroyer on maneuvers in the Baltic Sea. Now that they've wrecked the military, maybe liberals should reconsider their stance on gun control and take up target practice, considering words like "pretty please" and "coexist" aren't in our avowed enemies' vocabularies. During the 2015 Values Voter Summit in D.C., Maj. Gen. Robert Dees (U.S. Army-Ret.) nailed it when he said military readiness is being "degraded by social experimentation," telling listeners, "we have to fix the problem of moral readiness." Without a doubt, neither moral or military readiness will occur under this or any future Democrat Party administration, simply because when it comes to national security, liberals always lead from behind -- except in matters of social engineering and political correctness.